Americans can be a bit schizophrenic about food. 1) Get yourself a nice cut of beef brisket. 2) Marinate in a specially crafted blend of spices. 4) Fork shred, so as to more easily embed flavour, without destroying the texture. 5) Gently smoke the meat for quite some time in a specialised smoker, over a variety of woods. 6) Heat to luke warm, put a big ole scoop on a sugar-infused lump of sponge rubber masquerading as a hamburger bun, along side a jumbo-sized serve of nothin, and sell. And the meat is delicious! But after all that care preparing it, they might as well fire it down your throat out of a cannon for all the trouble they go with serving it. You can _almost_ admire the purity of it - we're about the meat and nothing but the meat! - but not so much as you actually want to eat one of these styrofoam-encapsulated blobs a second time. Well just up the road from us is a place where occasionally is parked a trailer emblazoned "Big John's Texas BBQ". For all I know he makes a great sandwich - I've never had the heart to try one, after too many lukewarm lump experiences. But he makes spectacularly good meat. I'm not just saying that because the guy behind the counter has a Texan accent, and he's big (he may even be named John too.) I'm saying that because he's an artist. He paints pictures on my palette with protein and spice. A Michaelangelo of Meat. I've had it a couple of times for various reasons without ever actually ordering a sandwich, and its always delicious. And he sells it in bulk. So rather than risk another hamburger bun fiasco, the other weekend I bought a pound of brisket off him. I spent the morning making fresh french bread, and timed everything else to be finished just as the bread came out of the oven. I grilled some onions with some fire-roasted Hatch chilies until they got all caramelised and yummy. 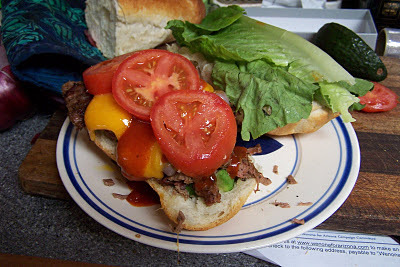 I heated the meat to mouth-scorchingly hot - quickly, so as not to dry it out - and melted some good sharp cheddar over it. I served it on the aforementioned fresh french with some avocado, some black pepper, some of Big John's own vinegar-ey spicey sauce that he kindly packed for me to go, also hot. Garnish with crisp romaine lettuce and fresh tomato straight out of the fridge, for that nice temperature contrast and crunch. If they served these I'd happily pay $20 for one. So why the extravagant care over the meat followed by nothing else? I dunno; just American schitzo cuisine I guess... but it really is fine fine meat.